The Nazi decision to exterminate the Jews worldwide was a culmination of centuries of persecution and antisemitism inspired by the teachings of the Christian church and its leaders. Jew hatred has been around since the dawn of Christianity and became a disease eating away the Christian soul for 2,000 years. After the crucifixion of Jesus, his early followers were considered a Jewish sect that believed that Jesus was Christ or “Messiah” who was sent by G-d. Mainstream Judaism rejected this belief as incorrect, as they also rejected the exhortations of leading rabbis that Bar Kochba, a second-century military leader, was the messiah. The Bar Kochba debacle led to the final destruction of the Jewish community in Israel in 135 CE, with disillusionment among the community toward the messiah enterprise. But the belief of those Jews in the first and second centuries that Jesus, a rebellious Jew from the Galilee, was the Messiah, would lead to an even bigger calamity for Jews that would last for millennia. With the passage of time, the Jewish–Christian sect grew and began to reach out to both mainstream Jews and pagans for new believers. But the Jews, freshly devastated by the loss of their nation and Temple, clung to the teachings of their fathers and held onto their Judaism. The belief in the G-d of their fathers was now the only vestige left of their once mighty and proud history. They therefore refused to join those who were preaching this new religion, which was a departure from their authentic Jewish beliefs that brought them comfort. The continued refusal of Jews to join in embracing Jesus led the early Christians to develop a bitter resentment toward them. This resentment led to the hatred and desire — even a need — to destroy those who refused to see their perspective. A narrative of hatred emerged explaining that the Jews lost their special status as “G-d’s chosen.” This status was now transferred to those who accepted Jesus as the Messiah. According to this narrative, the Jews were dammed to everlasting Hell, while Paradise was reserved for only Jesus’ believers. In the attempt to recruit more followers, the narrative ostracizing Jews for not accepting Jesus began to take on increased urgency and permanence. After Constantine and the Roman Empire embraced the growing Christianity in the third century), Church leaders found it politically untenable to maintain that the Roman Empire crucified Jesus, and they shifted the narrative to blaming the Jews for the crucifixion. Constantine, the Roman Emperor, was naturally pleased with this change. It was very uncomfortable for him to accept that his nation, the Roman Empire, was responsible for killing his newfound savior. Jews living throughout the Empire and Europe began to face mounting persecution as Christianity took hold. The new message was sticking: Jews were “Christ killers” and deserved no mercy. Sermons urging persecution and hatred of Jews were now an accepted staple of the message of Christianity delivered on Sundays. Often, these sermons led to physical assault and murder. His sermons became a template for the future generations. Younger priests following his lead would repeat his message frequently. Such sermons led to the murder of Jews and looting of their property, followed by expulsion from the realm. With the continued spread of Christianity, Jews were systematically persecuted as a result of the strident message of Chrysostom. His message was incorporated as an integral part of Christian dogma. Persecution took on several forms as the gentiles searched for innovative methods. Sermons of demonization led to burning down Jewish houses of worship, desecration of cemeteries, and the levies of huge and prohibitive “tolerance taxes.” Ultimately, to satisfy the ignorant population, the persecution led to expulsion from the realm. Even a cursory study of European history reveals that this pattern repeated itself in country after country. In fact, Jewish history is replete with the stories of expulsion from every European country at one time or another. Sometimes expulsions were repeated from the same country. The most famous such expulsion was from Spain in 1492, following the order by King Ferdinand and Queen Isabella to convert. The Church tortured and murdered those who refused to convert and remained in Spain. Close to half a million Jews who refused conversion were murdered and expelled. This anti-Jewish campaign was inspired and led by the infamous Catholic priest, Torquemada, the confessor of Isabella. Other countries followed suit, leading to the murder and expulsion of tens of thousands of Jews. As priests traveled to spread the word of the gospel, they included indoctrination in Jew hatred. The antisemitism of the Church evolved and took on newer forms. Blood libels accusing Jews of murdering Christian children to use their blood to bake matzos during Passover became a popular and oft-repeated method to terrorize Jews. Priests often boasted of their knowledge of Hebrew books such as the Torah and the Talmud, claiming that they read in these books that G-d ordered Jews to secure the blood of Christians, preferably children, for the baking of matzos for Passover. In fact, many priests were actually illiterate, as were most of their congregants. Had they actually known how to read Hebrew, they would have read the many passages prohibiting the consumption of blood by Jews. The halachah orders that all freshly slaughtered meat be salted in order to draw out even small amounts of blood from the meat. Nevertheless, in country after country, Jewish communities were terrified at Passover time, worrying about the impending blood libel. These campaigns were well-publicized and were usually initiated and spread by priests during Sunday sermons. Medieval Jews knew that each year, the Easter sermon of the priests would be followed by drunkenness that would inevitably lead to pogroms where any Jew caught would be killed or tortured and their property stolen. Jews knew to hide on Easter. Some communities opted to switch to using white wine for the four cups during the Seder, to avoid any misimpression that they were drinking Christian blood. The history of Church-inspired antisemitism reveals a lengthy litany of notorious actions, country by country, generation after generation. Jews were also blamed for pestilence, such as the Black Death, and other natural disasters or epidemics that occurred in the area. This demonization of the Jew became the standard narrative depicting Jews as a subhuman, devil-worshipping, moneygrubbing, Christ-killing, evil creature never to be trusted. According to Church teachings, discriminating against Jews was G-d’s desire. It pleased G-d, according to the priests, if Christians persecuted the accursed Jew. Interestingly, while Jews were persecuted, they were also subjected to pressures to convert. Perhaps the most notorious anti-Jewish priest was Martin Luther, the German theologian and religious reformer and founder of the Lutheran reformation. Luther represents the birth of Protestant Christianity as well as the genesis of the special brand of Jew hatred that flourished only in Germany. In his early career, Luther maintained that converting Jews to Christianity was not possible as long as the Church preached a doctrine that despised and persecuted them. He therefore advocated a “more gentle approach.” When the Jews rejected even his gentle approach and refused conversion, he became enraged and preached the destruction of the Jews instead. In his book “The Jews and Their Lies,” Luther proposed seven draconian measures of what he termed “sharp mercy” that he advocated for the ruling German princes to enact. These were Luther’s proposals to deal with the Jewish question. (7) Assign Jews to manual labor as a form of penance. 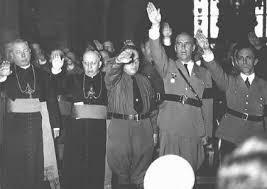 The heads of the Roman Catholic Church as well as the reformed Church were largely silent during the antisemitic Nazi-inspired mass murder committed in Germany, Hungary, Croatia, and Poland. 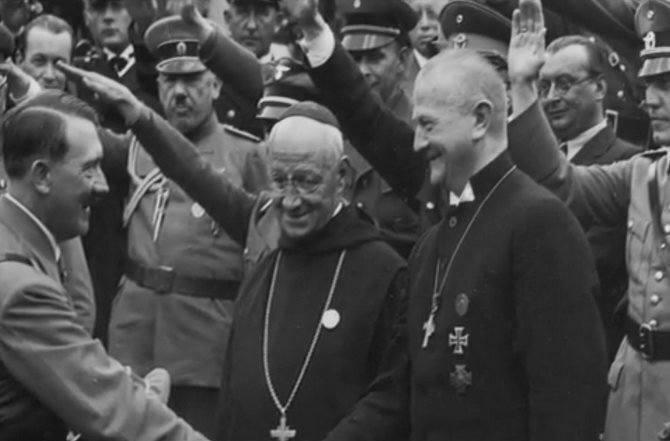 Many bishops, cardinals, and other Church leaders actively cooperated in the campaign, with some taking a leadership role in the extermination of the Jews. Pope Pius XII, often referred to as “Hitler’s Pope,” was silent even after concrete proof (the Auschwitz Protocols) was in the hands of the Church, describing the methodical murder of the Jews in Auschwitz. Hitler’s antisemitic rants may have fallen on deaf ears had the Church not prepared the climate among the good Christian Germans, Poles, Hungarians, and Croats to rid the world of the evil, blood-sucking Jew once and for all. It was this centuries-old preaching that enabled all these good Christians to actively aid the Germans in their collective goal: murder of all the Jews. What country in Europe with a well-established Christian Church does not have a history of persecution and murder of her Jewish neighbors that spans the centuries? While there was a lull in the public expressions of antisemitism for a brief moment after the Second World War, the Church-inspired Jew hatred was far too ingrained in the European psyche to suppress their blood lust for long. It is this belief that shamelessly allows the Austrians, notorious Nazis and countrymen of Hitler, to claim that they were the Nazis’ “first victims.” They willingly flocked to Hitler and Nazism, with over a million Austrians lining the boulevards of Vienna, eagerly and happily welcoming Hitler after the Anschluss, or conjoining of Germany with Austria. Centuries of sermons inspired Hungary to pass the first modern anti-Jewish law (numerus clausus) in 1920, years before the advent of the Nazi Nuremberg Laws. Without active Hungarian cooperation, Eichmann could not possibly have shipped over half a million Hungarian Jews to Auschwitz, that notorious extermination camp in Poland, in just seven weeks. Hungary today erects statues honoring some of the most notorious Hungarian murderers as authentic Hungarian heroes. They attempt to rewrite history and claim that their country was a victim of Nazi Germany, too. They were active and willing collaborators who robbed and killed Jews and then went to church to confess their sins. The murder of Jews was probably never confessed. Yes, today the Polish government would like to rewrite history and wash itself of the stench and filth of complicity in the murder. But my parents, both survivors of that death camp in Poland, often told me of the kapos and “block elteste,” all Polish, who ran the camps and eagerly did the bidding of the Germans, torturing and beating the Jewish prisoners. They often outdid the Nazis in brutality. Did Hungarians or Poles or Croats think of themselves as monsters? Not at all! They were good Christians who loved their country and were kind to their neighbors. This was the legacy of the doctrine of the Church. Many of the Eastern European countries where Jews were historically persecuted are devoutly Christian, with an active Church. Today, citizens of these countries have elected leaders with a radically rightward shift. Antisemitism has resurfaced once again. Look at Croatia, Poland, Hungary, and Austria. In those countries where the government has not made such a rightward shift, look out; it’s coming. So, as many of these countries erect statues commemorating the fascist, Jew-hating leaders of the past, let us remember the doctrine that taught such inhumanity—Church dogma. Hitler, never an original thinker, simply borrowed age-old concepts. The belief that the Jew was somehow not as human as the Christian allowed otherwise “good Christians” to murder six million men, women, and children. After all, they were simply doing G-d’s work!